Simply the best value in a premium RO system available anywhere! We guarantee it! If you find a cheaper price on a reverse osmosis system with comparable components, we will beat it! Call us toll free at 1-866-376-2690. The ClearPlus reverse osmosis water filter system offers premium quality drinking water at a fraction of the cost of bottled water and without the hassle of re-filling bottles. Bottled-water quality drinking water will be right at your fingertips anytime you need it, for drinking, cooking, and more. 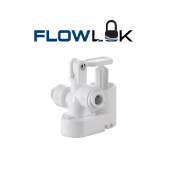 Its compact size makes it a great choice for use in homes, cottages, recreational properties, and RVs! approx. 0.0005 micron nominal filtration! Reverse osmosis, also known as nano or ultra-filtration, is the finest home water treatment system available. It uses the same technology as most commercial bottled water plants (but obviously on a smaller scale). Reverse osmosis systems are capable of removing most sediments and particulates down to less than 0.0005 microns as well as bacteria, viruses, Cryptosporidium, Giardia (Beaver fever), most heavy metals, asbestos, chlorine, fluoride, and a wide range of volatile organic compounds including many pesticides and herbicides. No home water treatment system offers such wide spectrum contaminant removal. The ClearPlus reverse osmosis (RO) drinking water systems provide good clean water at a very economical price. In fact, we challenge anyone to find a better RO system for a comparable price. All ClearChoice reverse osmosis systems include a quality 50 gallon per day Thin Film Composite (TFC) reverse osmosis membrane, sediment pre-filter, both pre and post carbon filters, a chrome-plated long-reach faucet, automatic shut-off, and a quality 3.2 gallon storage tank. Moreover, ClearChoice is made in the USA* so you know the components and workmanship are of the highest quality. Like other reverse osmosis systems, The ClearPlus multi-stage reverse osmosis system operates on the principal of osmosis (diffusion) of water through a semi-permeable membrane using ordinary household water line pressure (recommended pressure of 35 to 100 psi - the average residential home has a pressure of about 60 psi) - an optional RO booster pump is recommended if your water pressure is below 35-40 psi. The microscopic pores in the Thin Film Composite membrane (TFC) only allow pure water to pass through to your drinking water. The vast majority of contaminants are too large to pass through the membrane. A continuous self-cleaning process called "crossflow" keeps the RO membrane from fouling pre-maturely by washing contaminants away from the membrane and down the drain. For more information on reverse osmosis technology, CLICK HERE. Operating water temperature range: 40-100F. Operating pH Range: 3.0 to 11.0. - reduces chlorine (and chlorine bi-products), bad tastes, odors, and most fungicides, pesticides, volatile organic compounds, and more. - This is the primary component of the system. The TFC membrane separates up to 99%+ of most remaining unwanted impurities from your water, including bacteria, chlorine, trihalomethanes, E.Coli, giardia, cryptosporidium, nitrates, fluoride, heavy metals, inorganic minerals, and more. Output / Production Approximately 50 gallons per day based on average residential water pressure and feed water conditions. Self-Cleaning Like all high quality reverse osmosis systems, the ClearPlus RO system uses a process of crossflow to constantly clean the membrane to prevent pre-mature fouling and clogging. ClearChoice RO features a very low waste water ratio of approximately 3:1 while maintaining excellent cross-flow cleaning capabilities. This system is designed for use on all chlorinated and non-chlorinated potable water supplies. It is an excellent choice for most homes. If you do not receive your water from a municipal water system (you get your water from a well, lake or other non-treated source), you should have your water tested to ensure it is biologically safe (free of bacteria, viruses, and other harmful microorganisms) before using a reverse osmosis filter as your only water treatment. If your water is biologically contaminated, you should consider a whole-house ultraviolet purifier in addition to your reverse osmosis unit to kill any remaining microorganisms. 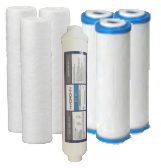 Residual Chlorine: <2.0 mg/L We are proud to use Filmtec TW30-1812-50 membranes in our ClearPlus RO systems. These membranes are tested an certified by NSF to ANSI/NSF Component Standard 58 for the reduction of turbidity, pentavalent arsenic, barium, cadmium, trivalent and pentavalent chromium, copper, fluoride, lead, radium 226/228, and selenium. The filtration unit and storage tank mount under your sink, out of sight. Water supply is gained by attaching a simple saddle valve to your cold water supply pipe (copper or plastic). You will have to drill a hole in your countertop or sink frame to attach the attractive stainless chrome-plated long-reach faucet. It is a relatively easy do-it-yourself project, or if you prefer, you can have it installed by a handyman or plumber. The unit includes all installation hardware and a complete installation guide. Had a piece missing when installing but the service dept sent me the part as soon as I contacted them, good service and the thing works perfectly. 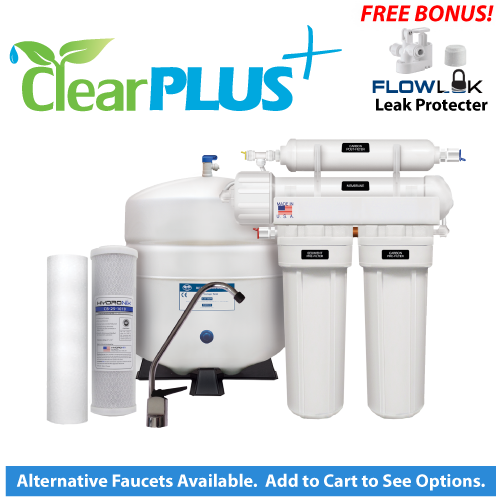 - Marc L.
Our ClearPlus RO water filter system are backed by a 100% 2-year limited parts replacement warranty against manufacturing and workmanship defects, including the housings, storage tank, faucet, fittings, and O-rings (excluding filters), subject to the feed water conditions noted above. Most competitors only offer a 1 year warranty! For health reasons, we do not accept returns of water filters/systems after they have been installed. If you are in doubt as to which filter is best for your needs, please feel free to call us toll free at 1-866-376-2690.